State-owned telecom company BSNL has relaunched their mobile app, and some very interesting features have been added. Now, users can get reward points for watching advertisements on the app, which can be converted into cash for some selected digital wallet users. Not only that, BSNL’s new app: My BSNL App will also allow users to chat with other BSNL users, free of cost. This is certainly a Whatsapp rival here. Note here: The app has been updated and relaunched on Google Play Store, but the iOS version is still not updated. A section of the app has been incubated with a unique reward-based advertisement viewing feature. My BSNL App users can watch advertisements across 18 categories, and based on that, they will get reward points. These reward points can be used in two ways: Use them while shopping at BSNL’s partner sites/apps or convert them into cash, and deposit it into some selected mobile wallets. We don’t have the list of eWallets where these reward points can be converted. Users can opt out of the program at any time, and can also set frequency and categories of the advertisements. The newly updated app from BSNL also has a feature wherein users can chat with their friends who are in the address book. This has been modeled on the lines of Whatsapp chat, and hence, BSNL is attempting to rival Whatsapp here. My BSNL App also includes features of paying utility bills such as postpaid bills of BSNL and other telcos and also do a quick recharge of your mobile. BSNL has partnered with various service providers across the globe and provides access to 44 million WiFi hotspots, spread across the world. The International WiFi plan costs Rs 501. This feature can be accessed via My BSNL App, which is pretty useful for travelers and tourists. The app also has the feature to automatically check data usage of the users, and also account balance in case of pre-paid, and current payment due in case of post-paid connection. Although the features and services being offered by BSNL look good, the actual users aren’t so happy after all. The app has generated 5 million downloads, and have received 82,000+ reviews. 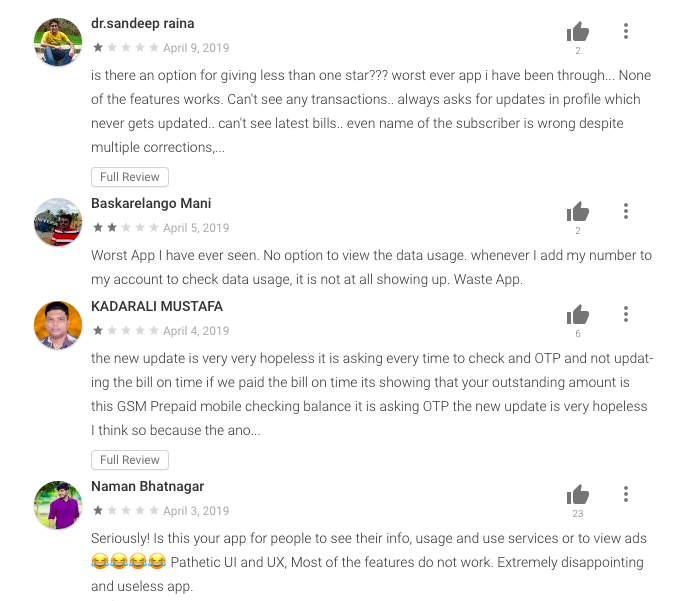 Although the average rating is 3.7, but the recent reviews posted by BSNL app users aren’t so encouraging. Are you using BSNL’s app? Do share your experience by commenting right here!